It is “...the first school of science and school of civil engineering, which has had a continuous existence, to be established in any English-speaking country” according to Palmer C. Ricketts in his preface to the second edition of his History of Rensselaer Polytechnic Institute (1914). 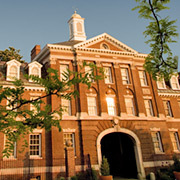 In 1833 the school became the Rensselaer Institute, and in the 1850s its purpose was broadened to become a polytechnic institution. 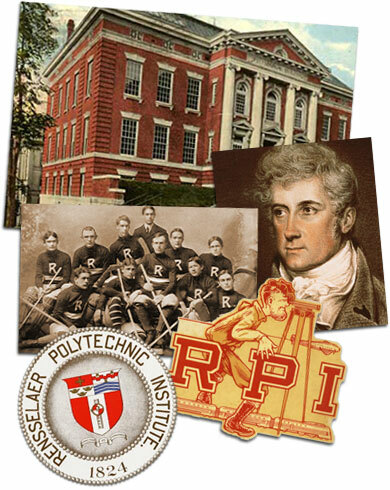 The Institute’s name was changed in 1861 to Rensselaer Polytechnic Institute. Rensselaer maintains an online archive of five rare books covering the Institute’s early history. Published between 1855 and 1968, the books detail Rensselaer’s founding and development, and place the school in the context of scientific and technological education in the 19th and 20th centuries. The Approach - A massive granite staircase between Rensselaer Polytechnic Institute and downtown Troy.